Canon's VIXIA HF M300 Flash Memory Camcorder is a 1920 x 1080 high definition camera that records up to 12 hours of video (LP mode) to SD/SDHC memory cards. The HF M300 also doubles as a digital still camera with the ability to shoot 3.3MP stills, along with Dual Shot capture and capturing stills from already shot movies, among other functions. At the heart of the HF M300 is the 3.89MP Full HD CMOS sensor and Canon's DIGIC DV III Image Processor. Other tools, like the Canon HD Video Lens, Dynamic SuperRange Optical Image Stabilization, a 2.7" LCD, and 18x Advanced Zoom all help to capture your videos with ease. Other beneficial features include 24Mbps AVCHD recording, 24p and 30p frame modes, and microphone and headphone terminals. Features like Touch & Track, Face Detection, Advanced Video Snapshot, and Instant AF all take the guesswork out of getting just the shot you want. And last but not least, the HF M300 provides you with a video light and built-in flash for low-light shooting of both video and stills. The VIXIA HF M300 camcorder features Canon's Instant AF focusing system which offers an improvement in auto focus speed and accuracy (compared to traditional auto focus systems). The Instant AF feature uses an external sensor, in combination with Canon's auto focus system, to help significantly decrease the time it takes to find focus, even in low light conditions. This system achieves focus instantaneously, reducing focus "hunting." This is especially beneficial in high brightness or night shooting situations. In addition, with Instant AF it's possible to capture fast, accurate focusing, even when following a moving subject. The same Face Detection technology used in Canon digital cameras is available in the VIXIA HF M300 high definition camcorder. Up to 35 faces can be tracked automatically, ensuring razor-sharp focus and natural, accurate exposure. Of the faces tracked, 9 detection frames can be displayed at one time. The system is in fact so smart that it will recognize faces turned downwards or sideways. 24p Cinema Mode enables all aspiring moviemakers to achieve a professional "film-look." You can change the camcorder's frame capture rate to 24p (recorded at 60i), which provides the appearance of the same frame rate as movie film. In addition, you can use the VIXIA HF M300's CINE setting, which changes the color and tonal characteristics, evoking the look and feel of a movie shown in a theater. For added flexibility, these settings can be used together or independently. The Pixela ImageMixer 3SE video editing software allows for payback of recorded video on your computer and editing in which you can trim, reorder, and combine scenes, as well as add music, titles, and transitions. With the Pixela ImageMixer 3SE Software, you can burn a standard definition DVD to relive the memories on your TV. And to perfectly complement the Video Snapshot feature found on Canon flash memory camcorders, a music CD containing royalty-free soundtracks is also provided. This program is designed to work on computers running Windows operating systems only. 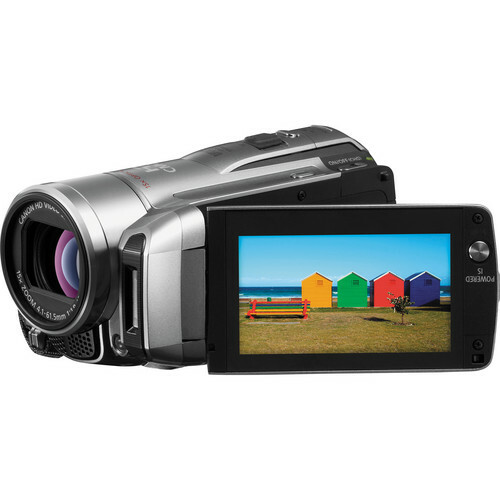 Box Dimensions (LxWxH) 10.5 x 9.2 x 6.0"
VIXIA HF M300 Flash Memory Camcorder is rated 4.5 out of 5 by 149. Rated 3 out of 5 by Anonymous from Good but better at previous price Was looking for low price camcorder with mic input and remote control. Saw great price on this and went into store on May 13 to buy and was bummed to hear that the price went up overnight. Surprising since it is a 2010 model. Still bought it and can see why there are complaints about the touch screen which requires a very firm touch to respond so the remote comes in handy. Low light isn't great and the Cinema Mode isn't very convincing. I like how compact it is and the quality is excellent in normal light. The battery lasts barely an hour. It was a slam dunk at the previous price so still debating whether this or the Panasonic SD90. Rated 4 out of 5 by Proud Poppa from The Good Stuff After shooting a few of my boys' ballgames, I'm certainly glad I bought this camera. I do recommend buying the extended battery and the external battery charger. The camera is easy to shoot with and easy to get smooth shots at a distance with the image stabilization. It also plug and played with my MacBook Pro and worked great with iMovie. The only reason this camera didn't get a 5 star was because it doesn't have any built in memory. I haven't had an opportunity arise where I would've need it yet, but having built in memory for a back up seems like a plus. Operation with the long life battery wasn't bad either, even with the extension beyond the back of the camera. Rated 5 out of 5 by Mum from Great little camcorder Easy to use, compact, perfect for capturing those special family moments, childrens sporting events, etc. Takes home movies to a whole new level. This is the 3rd camcorder I have owned, but the first digital camcorder. The small size, and good quality optics are very impressive. If you are an enthusiastic photo/video hobbiest as I am, it's very user friendly. Also, on the plus side, it does take photos - but they are of marginal quality. The only downside so far, (I've only had the camcorder for 2 weeks), is the short (1 hr), battery life, but I read about that ahead of time and simply ordered an extra battery. Outstanding value for the price. Rated 5 out of 5 by Anonymous from Great camera! Canon has created an avchd camcorder that has all the right features: external mic input, headphone out, composite and component out, on-screen vu meter, ability to adjust audio levels, and loads of easy to get to settings in the touch screen menu. And unlike many camcorders that record in mpeg4, this camera is completly compatible with Final Cut Pro using the log and transfer feature. Well done Canon! You've done something that Sony, Panasonic, and JVC have not done at this price level. Rated 4 out of 5 by Anonymous from Great performance We bought the Canon Vixia HF M300 camcorder after talking to a B&H expert. We needed a HD camcorder with an audio input jack and this camera it's exactly what we needed. And the price at B&H was a great deal! Some things you should consider: the camera has a touchscreen where you have all the menu items, etc. If you don't like touchscreens, then this camera is not for you. Another thing to bear in mind is that the output video format is MTS (a high definition digital video camera recorder format), so if you want to upload the video to the internet, so would probably need to convert it (which is not a major issue). In addition to the camera, you need to buy a SD memory card (we got a 16 GB also at B&H). Finally, you can charge the camera in different countries as the power input is 100-240V. Rated 4 out of 5 by Casmirri from Vixia HF M300 -Excellent small HD Camera I am a professional videographer who chose this camera to give my client to take around the world to shoot people asking questions for the Q&A section of their website. It is incredibly compact, and they needed an input for an external dynamic mic, which this unit has. It is easy for them to send me SD cards from anywhere in the world, and I can ingest the footage quickly for editing, without the hassle of capturing from tape, or having to have the camera with me to transfer from an internal hard drive. So far, it is very reliable, easy for them to use, and has provided good image quality. Overall, a great little camera for the reasonable price. If there is a down side, if you do need to use the menus, they are slightly confusing and not all that logical. Rated 4 out of 5 by Wood Chuck from Rough & tumble work I ordered this camera looking for something that could handle some rough outside work, and didn't want to destroy a camera that is more expensive - but still needed HD quality. This camera delivered! It was used to document flooding in South Dakota this spring, we have used it in studio work as an extra camera and it worked fine for this as well. This camera does not like to record in low light, all my scenes were outside or well lit tv stage, it does alot VERY well, but low light is not one of them. I spent the extra money on filters- another worthwhile investment. I'd buy one again if I destroyed this one!